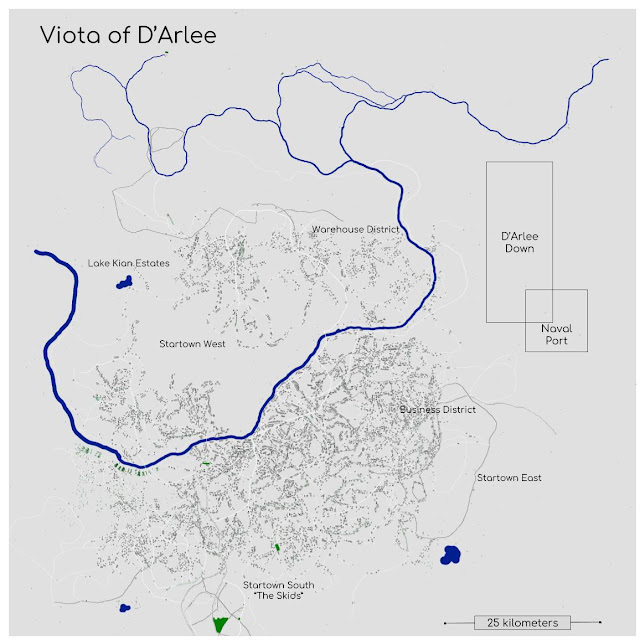 D'Alee supports both a high port and ground facilities. D'Arlee Down shares some space with the Naval port for some common facilities, particular craft that are not pure Naval vessels such as the soon to be transferred lab ship. 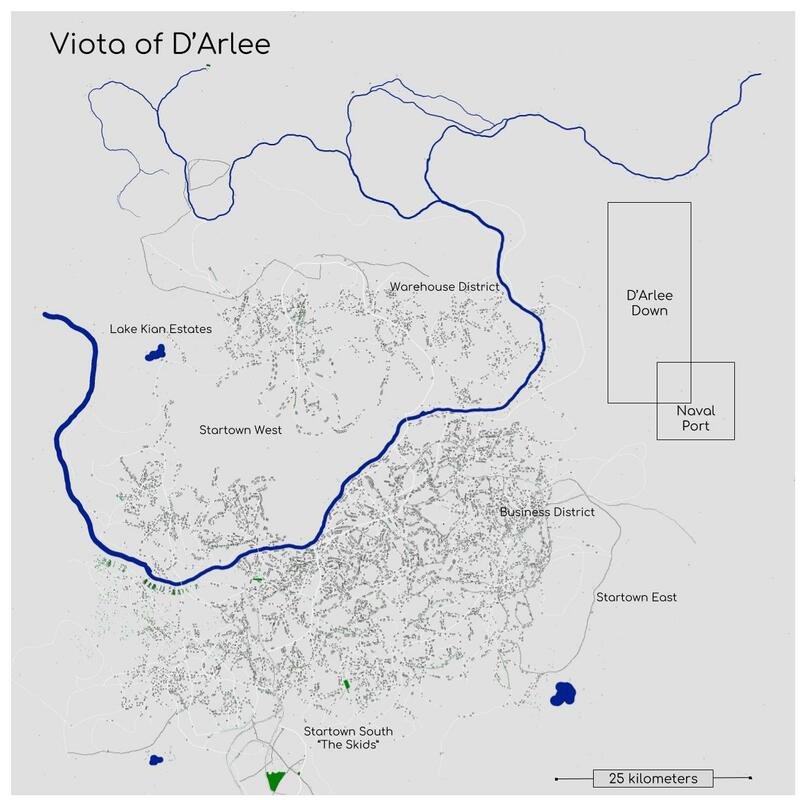 D'Arlee down covers about 300 square kilometers on the outskirts of Viota, which has, over the last hundred or so years, become more of a traditional startown than the original city planners may have wanted. Baor River bisects Viota into two main sections nicknamed Startown West and Startown East. Across the river, in Startown West, lies the main warehouse district. This area contains hundreds of warehouses ranging from a bare roof on metal trusses to fortified cargo depots. South of this, the business district contains brokers and businesses supporting the port as well as the Naval port. Brokers, bars, Naval recruitment centers and other professional facilities form the core of this section. As you head south and west, the businesses become less savory, and the traders and brokers may trade in things best unmentioned. This section of town, nicknamed the Skids. has bars of loose morals and rumors of criminal elements are not far from the truth. The police and Navy military patrols occasionally pass through, but this is a favorite haunt of Naval personnel as well as trader crews on leave when on D'Arlee. Startown West, as you move out from the warehouse district, has the better quality suppliers and more uptown offices. This is the area the D'Alee government maintains business dealings with the ports, and police are more visible. Moving further west, as you approach Lake Kian and its estates, houses and businesses are farther apart and more luxurious. Most residences are fenced, and some may have military grade defenses in place according to rumors. Viota has approximately 150,000 residents in the city and the neighboring suburbs. I used the RPG City Map generator to create the city, then Google Draw to add text and the ports. The city generator also lets you save the image into smaller, more detailed images. So while the main image is 3200 pixels, I also exported 16 (4x4) images also at that resolution. So I can plans the mean streets of Viota depending on what the players end up doing. I see gun fights as a possibility, although with a law level of 8, not sure how that will actually happen!